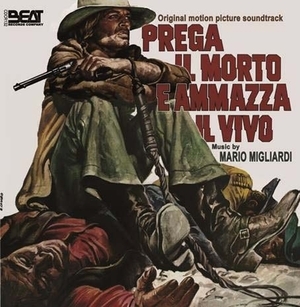 The 472nd Soundtrack of the Week is, I think, the third score we've listened to from the great Mario Migliardi. This one is for a movie called or Prega il morto e ammazza il vivo. As is often the case, there are a few themes that get repeated with different arrangements and in between there are more atmospheric and/or dramatic cues. There's something special about Migliardi's music, though. It goes to different places and reveals an unusually broad frame of reference, equally comfortable with blasting acid rock and contemporary classical music. The main theme is "Who Is That Man? ", initially presented as a song with English-language lyrics. It's a bluesy, late-night sort of torch song with organ creating sonic clouds and harmonica and whistling wrapping around each other. Later we hear it as a solo Hammond organ piece, then in an arrangement similar to the song version but without the singer or the whistler. The other song is "I'm Not Your Pony", a jazz waltz with a breezy, easy listening yet minimalist arrangement. There's an instrumental version with the singer replaced by harmonica. "Sequence 2" is a great example of building tension as Migliardi weaves together percussion, piano and some kind of electronic keyboard. "Sequence 3" is a weird, hallucinatory track that uses choppy strings and what sounds like manipulated recordings of bird calls. "Sequence 4" is recognizable as a blend of modern and aggravated chamber music, mixed with bass and drums and percussion, reiterating the "Sequence 2" statement. "Sequence 5" has a fever dream quality to it, with certain repetitive figures fading in and out, before switching gears to a slow, dark, heavy section. "Sequence 6" continues to surprise, with all sorts of sounds bubbling up, from inside of the piano and what might be tape manipulation and keening dissonant tones. "Sequence 7" starts much the same way before becoming a violin or viola solo, which in turn gives way to distorted, echoed and manipulated recordings of laughter. And that's about the range of cues on this intense and fascinating record. Migliardi is responsible for some of the most interesting, unusual and enjoyable film music I've ever heard.